As everyone is different, we also understand that people want different things from their holiday. And whether you want to relax by the pool for ten days or throw yourself into our activities and sports for your stay, we hope that everyone will enjoy their time with us. 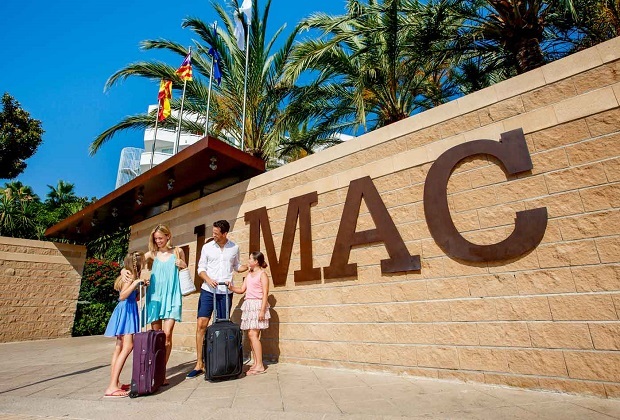 In this blog, we’ve collected together some useful information for your holiday at Club MAC, and some extra info on what to do before you arrive. While we’ve made sure there is plenty to do for every age group at Club MAC, it’s important to know that there’s absolutely no pressure to do anything at all if you don’t want to! For us, it’s about providing all the options for you to craft your perfect family getaway. The first thing you should do when you get here is download our Club MAC app. It’s available on the App Store and Google Play and has loads of info. For example, you can find out the daily menu and entertainment programme, all from your phone. Here’s a non-exhaustive list of various bits of info that might come in handy during your stay with us. Don’t forget to check the website for more, or pop into Guest Services where our team is always happy to help out. Shuttle bus to the beach and port – from mid-June to mid-September this goes every half an hour from in front of Marte building. The bus to the beach starts at 10am every day and the bus to the port starts at 7.30pm every evening. If you’re visiting before mid-June or after mid-September, check with reception. TV channels – there are lots of channels available ranging from BBC World News to Nickelodeon, Five, Sky News, Sky Movies Disney, Sky Movies Family, BBC 1 and 2, Film 4, More 4, ITV 2,3 and 4 and many others. Pay per view is priced at 3,70 Euros per day (12pm to 12pm the next day) or 19,90 Euros per week. You can rent a remote control and pick your pay per view channels at reception. Club MAC shop – you’ll find this behind Marte. Our shop is stocked with newspapers, magazines, sweets, crisps, drinks, sun cream and much more. It’s open every day from 9am and has everything you need for your holiday. Medical service – Club MAC has a 24-hour medical service available with English speaking doctors. All travel insurances are accepted but check your excess before you choose your policy for details of how much you’d need to pay at point of service. Checking out – you will need to leave your room before 11am on the day of your departure. It is possible to book a late check out subject to availability at 27,50 Euros up until 6pm and 38,00 Euros until midnight. You must book this with reception. Room safe – we can’t take responsibility for any valuables unless they are locked in safety deposit boxes. These are available at a charge of 3,80 Euros per day and 20,95 Euros per week. You’ll need to pay a 5 Euro deposit, which is refundable at the end of your stay. Security – Club MAC is for residents only and you must wear your all-inclusive bracelet at all times. If the fire alarm goes off continuously, leave the building by the nearest exit. Guest house – our reception desk is located in Jupiter, and the team can help you with all of our sports activities, entertainment, activities in Alcudia, markets and help with any issues that may arise. It’s open every day between 10am and 6pm. WiFi – WiFi signal is available at no cost in all the ground floor lounges of the hotel buildings. It is also included in a Premium or Family Room rate. If you have a Standard Room and would like WiFi then you will be charged 5,00 Euros per week. For more handy information check out our website. We look forward to welcoming you to Club MAC and helping you have the best family holiday possible.